Senior DBHS USB President David Song poses in the Brahma mascot costume. This is his first year serving as the school mascot. Diamond Bar High School’s yellow and purple mascot has long been a familiar sight at rallies and events, running and waving alongside the crowd amidst a wave of cheers. However, while the Brahma is easily recognizable around campus, not many know who the student behind the costume is. 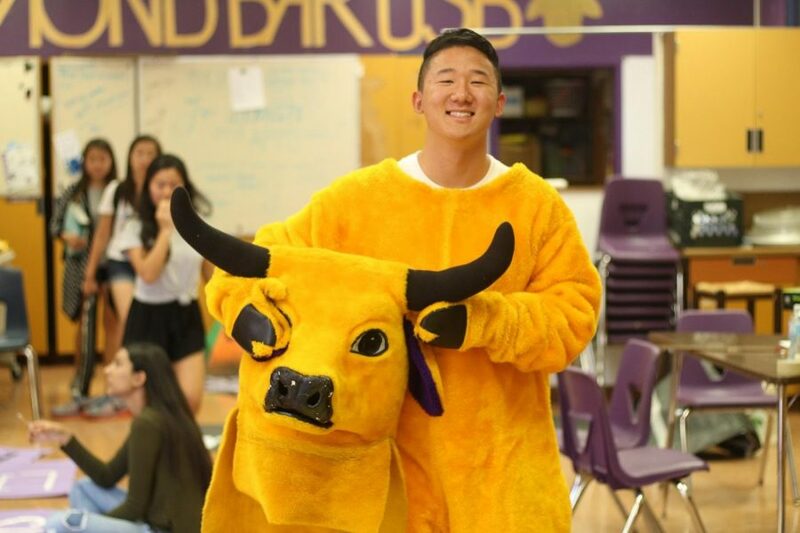 Turns out, the student inside the Brahma is pretty well known himself: USB president David Song, who is serving his first year as the school mascot. The senior stepped up for the job when asked if he was interested. Song spends from 10 minutes up to over an hour inside the suit, rallying student spirit and attending various community and school events. Naturally, moving around wearing a full body suit on a hot day can quickly heat up inside. The unbearable heat, difficulty to see through the head of the costume and the awkwardly sized costume are only some of the obstacles Song encounters when he’s wearing the suit. While Song is the main DBHS mascot, he occasionally switches off with fellow USB senior Paul Bang, who suited up as the mascot for the recent Rodeo Roundup, and other USB members who are interested. For some time in the past years, the Brahma suit was transferred between the custody of pep and video production before it was returned to USB. For now, the mascots will be chosen within USB, but that might change with increased student interest in serving in the role. Previously, there was a mascot team and the tradition might be revived if enough students are willing to become mascots, according to Song. “It’s really hot, it’s cramped, you can’t see correctly, but it’s a unique experience,” Song said.